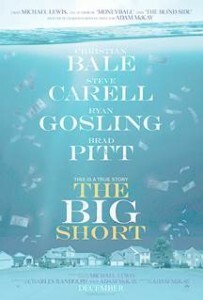 Fueled by a lifelong desire to poke holes in system and seek truth, investor Mark Baum (Steve Carell) and his team of fund managers smell blood in the water upon reviewing a flaw in the banking system exposed by Dr. Michael Burry (Christian Bale) and fund seller Jared Vennett (Ryan Gosling). Betting against the house (so to speak) on the housing industry, a small group of investors stand to make millions based on the economy’s collapse. Success based on utter failure, who were the real winners and losers in the housing bubble collapse of the mid 2000’s? Directed by Adam McKay (Anchorman, Step Brothers) the comedic overtones are ripe throughout this historical look back/black comedy of the housing bubble crisis, mind you this isn’t Ron Burgundy ha ha funny, but rather, oh my god this horrible train wreck that impacted all of us needs some humor in order to be palatable and understood. Breaking down complex financial topics into easily digestible chunks via celebrity explanation and a broken 4th wall McKay has made a rather breezy watch out of what could be a very droll topic, and frankly, anything that can educate the public and entertain at the same time is a notable feat, good on ya. Meanwhile, acting from the ensemble feels up to speed, although Brad Pitt’s character feels a bit less fleshed out and raises a few questions. None the less, a fine way to spend your holiday, and getting smarter at the same time, now if you’ll excuse me I need to go follow the investment strategies of Dr. Burry. The Big Short is rated R.